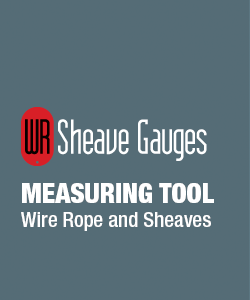 The Sheave Gauge is manufactured to Nominal plus 5%, the wire gauge measures the nominal size. When the sheave gauge is placed in the groove, the geometries should match without any space at the sides or bottom. Because the gauges are made in small quantities we can custom design sets specifically for your needs. Standard sets available in 10, 12, 15, 20 blade sets. Custom orders can be manufactured in any size from 1 to 20 blade sets.